Our senses can be used to help us relax and to calm down; they can be used to make us more alert, and they can also be used to help us feel more organized and in tune with our body. 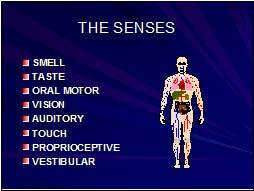 Sensory preferences are very individual, what calms one person may irritate another. Sensory input is especially helpful when our brain is not helping us out, for example when we are upset, distracted, stressed out, or ill. I call this the Body-Mind Connection as opposed to the Mind-Body Connection. Here are some examples that you could use if you were feeling stressed out (calming) or in need of some pepping up (alerting). Sensory activity examples are provided for both the external senses: taste, smell, vision, hearing, and touch and also for the internal senses that are less familiar to some people: oral motor sense, proprioception (joint and muscle sense), deep pressure touch, and the vestibular or balance sense. The internal senses are the real powerhouses for calming people down. Input from these senses can be used to calm people when they are about to lose control - when they are angry or upset. For example if someone you know is very agitated you could suggest they lie down for a while with a heavy quilt for a cover (deep pressure touch). If your partner comes home from work irritated and frustrated you could suggest trying going out for a jog or using the exercise bike (proprioception). If your elderly parent is anxious you could suggest using the glider chair on the porch (vestibular input). We use sensory input all the time to help us with self-regulation. Often we intuitively use sensory input with infants or children. We swaddle or hug a crying child. We rock a baby to sleep. We play active games outdoors with children knowing they will sleep better. Unfortunately we forget to use these sensory strategies for ourselves and for our patients. These simple activities can be used to help calm a patient who is manic, sooth an elderly person in pain, or calm an adolescent who is on the verge of hurting someone. Calming sensory input is extremely beneficial for patients with developmental disabilities and caregivers are always grateful for having positive and soothing ways to deal with agitation and maladaptive coping strategies such as self-harm. We are finding that the right sensory input can even help to reduce the need for restraints in mental health settings. Many behavioral problems actually have a sensory component and understanding sensory issues can be the first step in finding solutions for difficult behaviors. Occupational therapists evaluate patients to determine if there are sensory issues that are contributing to problems with behavior, function, and comfort. They can help the person or caregivers to develop a sensory "diet" specific to the needs of the patient that will flood their systems throughout the day with helpful sensory input that fosters emotional regulation and well-being. 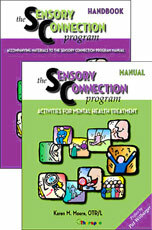 The Sensory Connection Program Manual and Handbook provide more extensive background on all of the senses including charts on calming and alerting characteristics of each sense. Activities are offered throughout the books the feature the use of all the senses for emotional regulation and stress management. Information is also provided about sensory issues related to various diagnoses including autism, schizophrenia, depression, and PTSD (post traumatic stress disorder).